Firearm Safe and Responsible Access Act: California’s strict new access prevention law won’t do anything to stop child shooting deaths. A file photo of a handgun. On Friday, California Gov. Jerry Brown signed into law the Firearm Safe and Responsible Access Act, which makes it a third-degree misdemeanor to knowingly store a loaded firearm in a place where an unsupervised child is likely to access it—regardless of whether or not the child actually does. Violators risk a potential $1,000 fine and/or six months in jail. The move gives California some of the strictest child access prevention laws in the nation, which is a good thing. Now it’s up to cops and prosecutors to determine whether the law will have any practical effect. I’ve written at length about my support for stricter child access prevention laws, and how they can help prevent unintentional child shooting deaths. Children wouldn’t shoot themselves or other children if they didn’t have access to guns, and they wouldn’t have access to guns if adult gun owners kept those guns locked up. By prosecuting parents and guardians who blatantly disregard common-sense gun safety procedures, states send a clear message that these gun incidents are not accidents, but foreseeable consequences of careless, negligent behavior. Prosecute enough people under these statutes, and, theoretically, other gun-owning, child-having adults will get the message and start taking the proper safety measures. Theoretically. In practice, it’s challenging to gauge the efficacy of these laws. Many states do not have any child access prevention laws. In those that do, the laws are inconsistently enforced. This new California law, which penalizes adults for unsafe gun storage even when nothing bad comes of their negligence, seems more symbolic than prophylactic. How does the state know if a private citizen keeps her handgun on the nightstand rather than in a gun safe? Will they send squads of gun-safety goons house to house? Hire a bunch of telepaths? The Firearm Safe and Responsible Access Act will be almost impossible to enforce. So what’s the point? But according to a Minnesota Public Radio story from last year, only 50 defendants have been convicted on negligent-storage charges since 2001—and many of those were only sentenced to probation. The story notes that prosecutors “often struggle to strike a balance between justice and compassion,” and that they are often loath to prosecute parents who are already grieving the loss of a child. As such, the law is rarely applied. It exists mostly to give prosecutors an option to bring charges against a negligent parent, if they feel that charges are appropriate. It is symbolically important, but practically irrelevant. Since 1998, Massachusetts has punished negligent storage of rifles or shotguns around children “by a fine of not less than $1,000 nor more than $10,000 or by imprisonment for not less than one year nor more than ten years, or by both such fine and imprisonment”; negligent storage of a handgun carries a minimum $5,000 fine and/or a two-and-a-half-year sentence. But police generally can’t enter a house without a warrant, so as a practical matter the law is only enforced in cases of tragedy, or after cops receive a tip. This does happen—a couple of weeks ago, a Massachusetts college student named Jad Ali Mokdad was arrested and charged with having an unsecured gun accessible to a minor after cops received a tip from employees at a local gun store—but not very often, and almost always in conjunction with something else. In Mokdad’s case, the cops originally suspected that he was illegally outfitting his rifles with high-capacity magazines; the improper-storage charge was an unexpected bonus. Similarly, in late 2012, Boston cops raided the house of a career criminal named Magnetic Tom, looking for guns—which, as a felon, he was not allowed to own. They found them, stored improperly in a laundry sack and nightstand, with five young children around; Tom was charged under the state’s improper-storage laws. I could find very little evidence of parents or guardians in Massachusetts being charged exclusively with unsafe storage around minors. In the Bay State, it seems, safe storage laws exist primarily so that prosecutors can stack charges against defendants accused of other gun crimes. So what does all this mean for California? While I couldn’t find much information about how D.C.’s law has played out, the Massachusetts and Minnesota statutes seem to suggest that California gun owners need not be worried about overzealous enforcement and prosecution. A reasonable expectation is that under the Firearm Safe and Responsible Access Act, good citizens might be more likely to report instances of lax gun safety, and some gun owners will pre-emptively reform their own safety practices. Californians should hope for more. We live in a nation where, thankfully, cops cannot storm into private homes and demand compliance with various public health statutes. But there’s a difference between actively seeking out gun-safety violators and treating those violations seriously when they’re found. A toothless, unenforced law is an ineffective one, and if the Firearm Safe and Responsible Access Act is to be more than just symbolically valuable, Golden State officials need to make it unequivocal: If we catch you acting irresponsible with guns when there are kids around, you will be arrested and prosecuted, period. 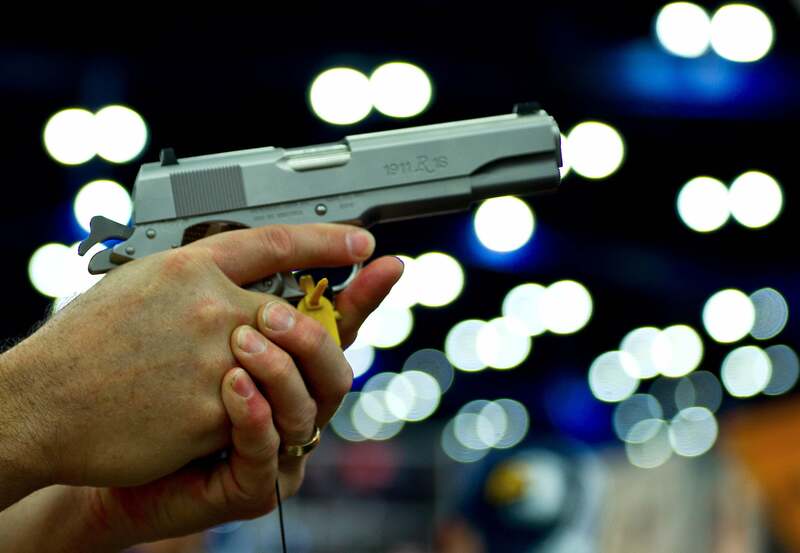 “Ensuring guns are out of the reach of children and holding those accountable who are irresponsible is the first step in reducing firearm accidents,” the California bill’s co-sponsor, Jimmy Gomez, said in a press release. Gomez is right. This bill is a first step, and nothing more. Now it’s up to California to keep moving forward from here. A Wisconsin Boy Shot His Sister. Their Father Is Facing Charges. Other States Should Take Note. Two More Kids Were Shot With Their Relatives’ Guns. We Need to Pass Laws to Punish the Relatives. Another “Accidental” Shooting. Another Child Dead. Another State Claims, Wrongly, That No One Is at Fault. Is It Ever Really an Accident When a 4-Year-Old Shoots and Kills His Father? A 4-Year-Boy Killed His 2-Year-Old Brother and the Father Was Convicted of Manslaughter. Good.